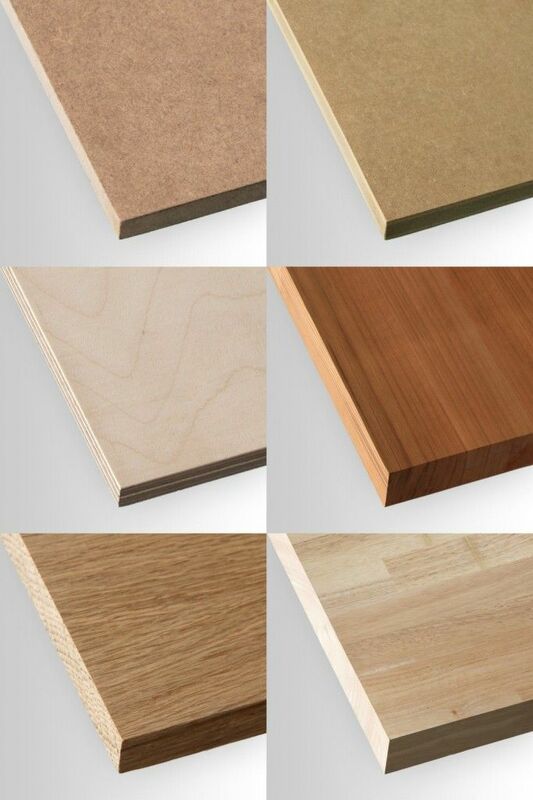 Often at I&E we are asked about the types of wood choices in cabinet material. There is a lot of confusion. So many of the terms are misleading! I&E wants you to make informed decisions. Before deciding you must have a particular type of wood, it is best to understand the properties that are most important to you. You should know how you will be using the wood. For instance, no matter what, for painted surfaces solid wood is not the best choice. Want them to not show grain or get those paint cracks at the corners? Then it is MDF you want! Solid wood is also called “ordinary lumber.” First of all, it’s not what you think. It is not wood cut from a tree and made directly into a cabinet. All modern commercial wood goes through some kind of processing and is treated. Solid wood means Not Hollow, with a solid wood surface. Cabinets can claim to be Solid Wood because they have a core of plywood and a veneer of ordinary lumber (such as Cherry!). It is completely legal to say that cabinets are solid wood as long as all exposed surfaces are solid wood. Be careful. If you want solid wood ask the right questions. Ask, “what is the center made of?” Pay attention to key words like “veneer.” It is a dead give-away! The main advantage of solid wood is that it repairs easily. Another advantage is that it is usually more fire and water resistant. The major disadvantage is that it is very expensive. If you are going to be painting the wood anyway, honestly – it is a waste of money to buy solid wood. Most of the time the grain will show through the paint and it will crack at the corners where the pieces meet. Have kids? Painted wood can’t take strong chemicals to clean it, or too much elbow grease (strong scrubbing).Painted MDF would be the right choice. Each type of wood that is engineered has its distinctive advantages and disadvantages when compared to solid wood. The one that they pretty much have across the board is price. It is much more cost friendly to have engineered or man-made manufactured wood cabinets. Some engineered types of wood are more water resistant than solid wood, however most is much less water resistant and will fall apart if submerged in water for too long. Man-made wood is also not as easy to repair, usually. What it does have going for it is Price. It is affordable, it looks very good, and if finished properly will be super easy to clean. MDF cabinets will be cheaper then solid wood, be easier to clean, have a beautiful smooth painted finish that will not crack at the seams. There are no Seams! Keep an open mind when you shop for cabinets. Always remember that it is more important that the cabinets fit into your life then it is for them to have the “right” label.